In design as in politics: who decides? The Seagram Building, 375 Park Ave., New York, by Ludwig Mies van der Rohe, serves as a metaphor for the model of political participation. Photo: Jules Antonio (Flickr). Some rights reserved. Can we keep on organizing decision-making processes as we used to do in the age of the Enlightenment or in a scenario where information only flows from top to bottom? Designers and creators have been questioning this for a long time now, seeking to go beyond the user paradigm which has determined innovation processes in recent decades. Today, their concern is how to put people at the center of new experiences. As we know, the rational-enlightened perspective was based on the hypothesis that it was the expert, the professional specifically trained in a given field, who could best decide what to do in relation to any area of human activity and interaction. 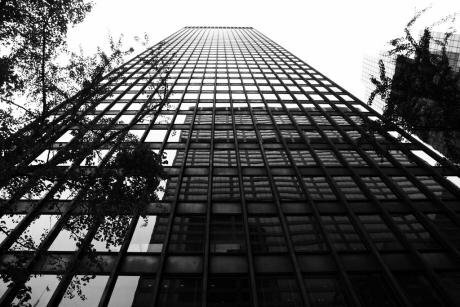 Mies van dere Rohe’s famous Seagram building on Park Avenue in New York is rightly considered a masterpiece of rationalist architecture. He designed the building from the perspective of what he believed to be the best possible combination of architectural rationality and ability to meet the needs of those who would inhabit it. Everything was thought through down to the last detail. He left no room for anyone to put some flowers on the window ledge. The windows open either completely or halfway, and it is not possible to open them in any intermediate position. And, of course, nobody can think of hanging curtains, since their presence could impair the building’s iconic, integral beauty. From the hierarchical perspective, which explicitly assumes the rational way of thinking - that is, from the relationship between one who "knows" and others who "do not know" -, the idea of participation is meaningless. The Seagram case is not an exception, but rather a paradigmatic example of a line of reasoning that goes well beyond the field of architecture. The democratization of education too was based on a rational and disciplinary logic, and therefore each academic sector sought to mark the limits of what was "its own", thus ensuring its share of power and specialization. The scientific organization of work also had that hierarchical and specialized component which determined the democratization of consumption on the basis of the advantages offered by technical innovation and product homogenization. In the 19th and a large part of the 20th century, there were "architects" who designed "ideological buildings" for us. Subsequently, from a commercial perspective that sought to increase sales capacity beyond the Fordist logic through the customizing of consumption, the importance of taking into account the opinion of the person who was to use what you offered became increasingly clear. Drivers, listeners, readers, and customers in general seemed to prefer some characteristics of the products over others. And so we entered the user world. Little by little, designers began to take into account the experience of using products, and therefore increasingly focused on contact interfaces, graphics, and all the elements of interaction between the object and the person who wished to use it. The perspective that guided this modulation in production was no longer the one that had guided Mies van de Rohe. The new rationale was to look first at the user requirements which the potential buyer would prioritize and, from there, design the rest. Apple designs are the quintessence of this outlook: user-friendly environments, enticing interfaces, shapes and structures that facilitate intuitive uses, thus avoiding the need to check the users’ guide. In fact, it is now more and more a matter of hiding the mechanical parts, the internal processes and the ins and outs of the products, and to prioritize the feeling that just by pressing a button everything happens smoothly, frictionless and effortless. The backstage logistics of Amazon, Apple or Spotify are huge, but to the user things are as simple as choosing a book, moving the cursor or picking a song, and then enjoying what you were looking for. So, now, the question we should have an answer for is whether we like to be just users of things that someone else has thought of, or whether we would also like to decide what we do and how we do it. Similarly, in the field of politics, things have gone down the same pathg. In the 19th and a large part of the 20th century, there were "architects" who designed "ideological buildings" for us. Thinkers and experts who, on the basis of shared value systems, diagnosed problems, built strategies, sought followers, and tried to change things from the perspective of their own coherent rationality – that is, they designed Fordist politics for hypothetically homogeneous audiences. Designers cannot avoid being participants, just as politicians cannot avoid being citizens. As so many analysts and scholars have shown, mass media and marketing techniques applied to politics put the desires and concerns of the people - the "users" of politics - in the foreground. The ideological and internal cooking behind each political formation is "concealed", and the capacity to satisfy the immediate desires of potential voters is put right at the forefront. Obviously, some parties and formations have gone down this path more than others, in the same way as not all products are equally friendly to each and every one of its users. Today, in the world of design, emphasis is being placed on the fact that all those who will want or will be able to use a product or service should be incorporated into the creative process itself. On the other hand, science has shown that we cannot imagine designing a building or constructing an infrastructure without taking into account the materials we use, the impact on the surroundings, and the effects on the environment and on the functioning of the city where the new building is located or the new service is to come into operation. The building, the infrastructure "participates" in a complex environment than cannot be ignored. The design of any object or activity is not immune to all that is around it and to the materials used to build or imagine it - nor is its destruction or disappearance. The design of "things" cannot be only a framework in which participants are to be assumed as data, the design itself has to be "participated". In this sense, designers cannot avoid being participants, just as politicians cannot avoid being citizens. In the same way as you cannot complain about a traffic jam where you find yourself stuck as if the whole problem was due to others, for the simple reason that you are part of this traffic and this jam. We need design and policy-making systems that do not have designers sitting in a bubble, seemingly immune to what goes on outside. We need political decision-making systems that invite-incite-engage people, rather than processes that ask people to participate in what others have thought needs to be done. And, surely, to do this, we need a little more humility when it comes to doing politics – and this implies changing power structures and the distribution of responsibilities. In the face of ever more complex problems, with more structural implications and more heterogeneous interests, we need a reconfiguration and an expansion of collective decision-making mechanisms.